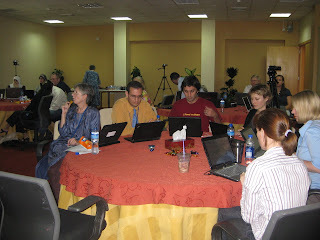 Over 30 people from all educational levels and styles in Doha attended the inaugural TEDx QA event. Held at Education City Recreation Centre Conference facility, the meeting was ostensibly the last gathering for the 21st Century Learners group for the academic year. The theme was therefore '21st Century Learning' and organisers were pleased to accept applications to present at the event from 3 different and diverse education leaders based in Doha. The format of the 3-hour session included watching 2 x TED talks, chosen by the attendees (Barry Schwartz on our loss of wisdom and then Benjamin Zander on music and passion), and then watching 3 x local presenters. In between these presentations round-table as well as whole room conversations and interactions took place as we talked about what it means to learn in the 21st century and how that impacts what we do as educators. 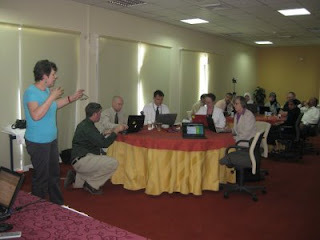 In addition we UStreamed the event and ran a backchannel for virt ual participants to be part of it. This is something we have been doing at all 21st Century Learner's events with great success. This allows non-attending participants globally to hear, see and interact with real participants and broaden the learning experience and level of debate for all. Congratulations to our presenters and thank you to everyone for making this TEDx event a success.